Here’s our spoiler-filled review of Finding Dory. Read through to the end for our review of Piper, the short film which accompanies Finding Dory in theaters. Don't forget to Like us on Facebook, and Subscribe to get each new review delivered to your inbox! A year after she helped clownfish Marlin rescue his son Nemo, the forgetful blue fish Dory starts remembering flashes of her own childhood, and remembers that she was swept away from her parents. Although she has found a sense of family with Marlin and Nemo, she remembers that she used to live near California. 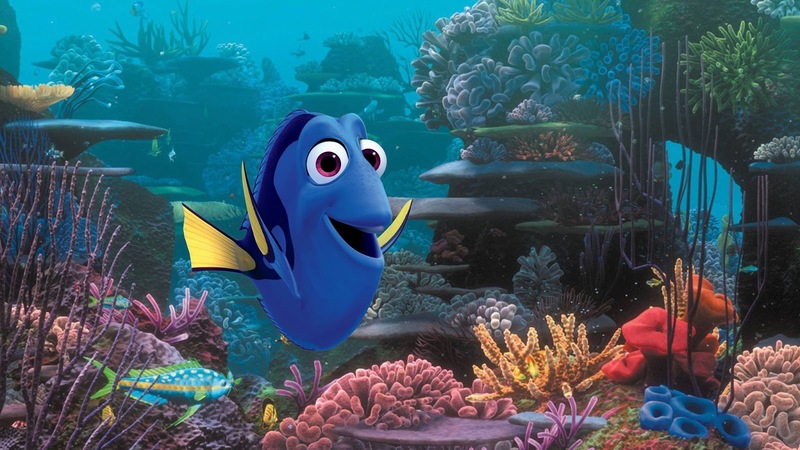 Going only on that, Dory becomes determined to find her parents, but her quest will be very challenging because of her pervasive short-term memory loss, which generally keeps her from remembering anything for longer than a few seconds. Because he remembers how bad he felt when Nemo was lost, Marlin agrees that he and Nemo will accompany Dory as she tries to find her parents. Along the trans-oceanic journey, Dory remembers more and more about her childhood. She is separated from Nemo and Marlin, but eventually she reaches the aquarium where she was born. In the aquarium, she enlists the help of old and new friends to explore many exhibits in an attempt to find her parents. Although she is reunited with Marlin and Nemo, and finds a community of blue fish like herself – even some who know her parents – her parents are not there, and she is told that it is believed that her parents died trying to find her. Dory is separated from Marlin and Nemo again, and finds herself in the open ocean, where she remembers something her parents told her about how to find them. She does find her parents, who have been steadfastly working to find her ever since the ocean took her away. Dory is happy to be with her parents, but remembers that Marlin and Nemo have been separated from her; she declares that Marlin and Nemo are also family to her, and so she leaves her parents to find Marlin and Nemo. Eventually, Dory manages to gather Marlin, Nemo, her parents, and some other friends together, and they decide to start a new, shared life. As the film ends, Dory is surrounded by her whole family – her original parents, and the friends that have become family to her. Dory lost her family after being swept away by an undertow. She has a hard time remembering them, and feels somewhat guilty for having lost them. At one point, she acknowledges that she does not remember where she grew up. She does believe that she’ll recognize her parents since they will look like her. She expresses that she greatly misses them, and decides that she must find them. She wonders whether they will still love her, since she feels responsible for losing them, but she finds that they have been waiting and longing for her return. Viewers who have been adopted or who have experienced foster care may resonate with many of Dory’s feelings: longing for birth parents, unwarranted guilt about the circumstances that led to their separation from birth parents, a sense of a loss of control, a sense of confusion and chaos, and dreaming of a happy reunion. When Dory does find her parents, she lets them know that Marlin and Nemo have become her family as well, and together they craft a new understanding of family which includes everyone that has come to love and care for Dory. Father-and-son fishes Marlin and Nemo remember what it was like to be separated from each other, and this empathy helps them support Dory in her quest. It’s always good to see a person’s quest for reunification be supported by those they love; in Closure, Angela is accompanied by her extended adoptive family; in Rio 2, Jewel is accompanied by her husband and kids. Finding Dory captures that support, as well. Finding Dory isn’t a story about adoption, but like folks who have been adopted (perhaps especially adopted from foster care), Dory has been swept away from one family into another, and she longs to reconnect with her first family. Finding Dory seems to embrace the concept of “Both/And” that Lori Holden has introduced – Marlin and Nemo have not replaced Dory’s need for her parents; finding her parents does not replace her need for Marlin and Nemo. It’s not that only one group can be her family – both groups are her family. Dory is aware of her short-term memory loss, and wonders whether her parents will ever forget her, or whether she will ever forget them; they assure her that they will always remember her, and that she will never forget them. 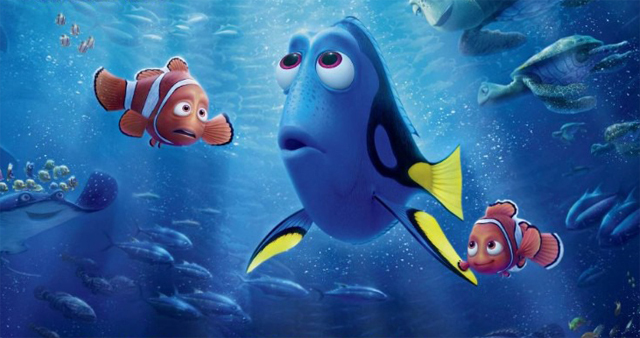 One fish challenges Dory, asking how she can know that she has a family if she has short term memory loss. She replies that she must have come from somewhere, and, of course she has parents, and even if she forgets their names or faces, they do not stop existing. That’s an important concept for adoption, too. An adopted person’s birth parents don’t stop existing just because they aren’t mentioned in conversation – and as Dory also shows – finding one’s original parents does not negate one’s newfound family. Even though Dory is not constantly thinking about her childhood, the memories are all in her mind, and certain events trigger her to remember them. Some adopted folks don’t pursue relationships with or information about their birth parents, but then later decide to when they’re triggered by some event in their lives. Just because you’ve approached it one way for years doesn’t mean that you have to approach it that way for the rest of your life. When Dory wonders whether her parents will want to see her, her friends assure her that they will be overjoyed to see her. Her friends are very supportive. When she meets her parents, they are truly ecstatic. Dory wanders away from Marlin and Nemo – and gets separated from them – when Marlin hurts Dory’s feelings with some carelessly chosen words (he tells her that the thing she is best at is forgetting.) Nemo continually reminds Marlin of his unkind words. Some kids might find it very difficult to see young, helpless Dory swept away from her parents, and then wandering alone asking strangers for help. They might also find it very sad when Dory becomes discouraged and starts to believe that she will not find her parents. They might also find it painful when, on several occasions, Dory comes close to finding her folks, but gets disappointed at the last moment. It’s very sad to hear her say that she was too late, and that she does not have family. She even describes herself as being completely alone and says that she has lost everyone. A kid behind me in the theater started crying right around then. Although the film reaches a happy ending – and Dory does find her parents – the emotional roller coaster could be hard for some viewers with a real-life parallel experience. Nemo wonders aloud whether Dory finding her parents means that he and Marlin will have to say goodbye to her. Marlin initially thinks that it will mean that, but it doesn’t turn out that way. 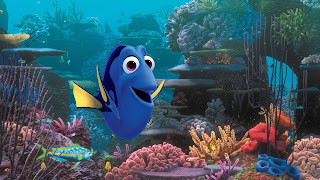 One character unkindly suggests that Dory probably lost her family because of her poor memory. Dory has struggled with self-doubt about whether she should blame herself, too. But thankfully, when the blame is presented by an external source, Dory is able to challenge it. Her response is strong: she says that it is wrong to say that she would lose someone she loves. One character suggests that Dory should just pick a couple fish that look like her and pretend that they are her parents. 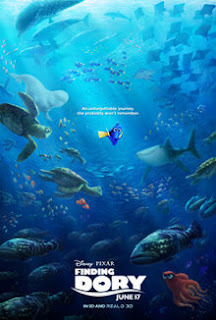 Finding Dory has some hard scenes involving parental loss and self-blame that could be hard for some viewers, but the overall theme appears to be positive and inclusive for adoptive families; your family will never forget you, and if you have two sets of family, one does not replace the other - they can both be your family. Parents should make sure that their kids can handle the hard parts (prescreening this one might be a good idea) – Dory’s disappointments and sadness will be too hard for some kids – but otherwise this one seems to have a lot of potential for kids ages 8 and up or so. Now that Dory has found her parents Charlie and Jenny, are Marlin and Nemo still her family, too? Why did Dory decide to try to find her parents? What do you think Marlin and Nemo felt like as they were helping Dory find her parents? Do you ever miss your first family? If you could choose who you saw every day, who would you see? How do you feel when your life doesn’t exactly match what your dream life would look like? What parts of your life make you sad? What parts make you happy? Do you ever worry about forgetting people who are important to you? How can we help make sure that our family will remember everyone that we care about? (This is a good opportunity to collect or draw and display pictures of everyone your child loves, cares about, and considers family, and parents can join too, including people that they love and have lost to death or distance, to help show that even though adoption is unique, the experience of separation from loved ones is something that you can understand to some extent). Dory sometimes feels like it's her fault that she and her parents got separated. How would you help her realize that it wasn't her fault? Do you ever blame yourself for something that might not be your fault? Finding Dory is paired with the short film, Piper, the story of a baby beach-bird learning to feed itself. After getting used to being fed by its parent, the baby is surprised when its parent flies away and does not bring back food. The baby must learn to find its own food. On its first outing, the baby is hit by a large wave; this appears to traumatize it, and it cowers back in its nest. The next wave it sees, even a long way away, terrorizes it. However, hunger motivates the baby bird to try again, and an unexpected friend teaches the baby that the waves can be helpful in finding food; the thing that had most scared the baby bird is actually an opportunity for success. Armed with this new information, the baby bird becomes the most prolific food gatherer of the flock, and takes unbridled joy in the very thing that had once paralyzed the baby bird with fear. This short will give parents the opportunity to talk with their children about things that have scared them; perhaps parents could help kids reflect on fears that they’ve overcome, and then apply that concept to fears that currently scare them. 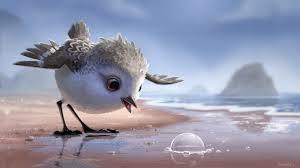 Parents can also point to a scene where a small wave is seen through the baby bird’s mind as a near-tsunami. Fears look different to different people. Some young viewers who have been neglected might find it hard to see the baby bird going hungry, and might resonate with a scene where the baby bird shakes in terror. Over all, though, Piper is beautifully done and at its heart has an encouraging message for kids (and adults) who sometimes find the world unbearably frightening – you can get through this! One additional thing occurs to me here. In Dori's search for family there's a mixed bag of emotions for viewers too. Some adoptees search and some don't. Those who do, do not always have an experience like Dori, many times the birth family is not found and sometimes even when it is there is not the hoped for happy reunion. Some movie, someday really needs to include these far more common scenarios. Do you have anything to back up you "many", is it 50%? 75%? or would "some" be a better term. I'd also suggest that adults searching already understand that they aren't guaranteed a specific reaction - they've lived with being adopted a very long time, thought deeply about searching and didn't just decide to put themselves out there in a very vulnerable position. The object of searching is not just seeking a "happy reunion", nor should it be the basis of whether someone else see's your search as a success. Seeking answers is so much more in many ways, from seeking of knowledge about who you are, where you came from, finding out ways you mirror others within your family, to who your ancestors were, what they were/are like, the why's, the stories, the journey is so much more than just a reunion. Hi Daisy, and theadoptedones - thanks for your comments. Daisy, you're right that not all real-life situations play out the way that Dori does. The movie Antwone Fisher might be an interesting film for you to check out; Antwone reconnects with both sides of his family, and the two meetings are quite different. Theadoptedones, thanks for your perspective; it's helpful to hear and important to remember that folks search for different reasons. I'm really glad you commented. Absolutely, Daisy J. As a screenwriter, and a mother, I see the need for real, not fantasy, adoption stories to be told in the movies. Getting them produced, however, is difficult. Studios like Disney are afraid audiences will not want to watch something too new, too "radical." We have to raise our voices, and shut our wallets, as parents, family, and friends, to get honest adoption films made. This IS a very real adoption story- well except it's about fish. I know several stories of finding birth parents much like this one. Disney is all about feel good endings- why expect them to become something different when addressing an adoption theme? Hi Anne and JLH - thanks for your comments. Although not every search will turn out like Dory's, I think that parents can, with discretion, use the film to start some worthwhile conversations with their kids about feelings, thoughts or wishes that their kids already have. Thanks for reading and sharing your thoughts! I'm glad you found this site! Great insights. I found them helpful. This review is ridiculous. How about considering adoptive families dealing with abusive and neglectful birth parents? Ok, let's go on a fun journey with my 4yr old to find her meth head mom and sexually abusive dad! Maybe they should have thought about this a little more than 3 minutes. I'm sorry that my review struck you as ridiculous. I work as a social worker in the foster care world, and I agree with you that some relationships are unhealthy and dangerous. At the same time, even some children who have been abused sometimes have conflicted feelings about their families and even about their abusers, and films like this one could help them talk about those feelings. Not every kid will have those feelings, and some kids will be completely glad to be away from a situation where they were hurt or neglected. Movies can be an invitation to a conversation, if it's a conversation that the kid wants to have but doesn't know how to start, but not every kid will need to have every conversation. Thanks for commenting. Well, now I don't have to see the movie. Hi Sylvia - thanks for commenting. I hope the review wasn't a negative thing for you. I am an adoptive person and now that I am out of the fog it would trigger the heck out of me and make me mad at my adoptive parents. Why were THEY not helping Dori find her parents? Everyone (the creatures in the movie) need counseling before reunion. Adoption is such a messed up thing for all involved (well maybe not the adoptive parents). It takes a lot of denial to do it. Hi ProBoard Bear - I'm glad you commented. I don't think Dory did have adoptive parents; it seems like Marlin and Nemo are the closest thing to family that she has, and they did support her in her quest to find her family - actually, Marlin was initially resistant to the idea, but he decided to help her when he remembered how sad he was when he had been separated from Nemo. Counseling would certainly be a helpful tool in reunion. From your last two sentences, it sounds like your adoption has been painful; I'm sad for the times you were not treated right. thanks again for sharing your thoughts. I am actually impressed with this movie, there is Dory who I can relate to because she has a disability, short term memory loss and I have high functioning autism. So I can say I was pleased to have a character to relate to. Thanks for sharing your comments. It is sad that one sea lion was bullied, but I am glad that you were able to relate to Dory. I'm glad you took the time to comment here!